Swallow Barn01263 715779work01603 870304fax Self-cateringSwallow Barn is a charming semi-detached converted flint and brick property situated in the village of Bodham close to the coastal towns of Sheringham and Cromer. An ideal location for both the coast and inland towns like Holt with its Georgian properties, independent shops, good restaurants, pubs and Coffee shops just a few miles away. Swallow Barn offers weekly bookings starting on Friday. 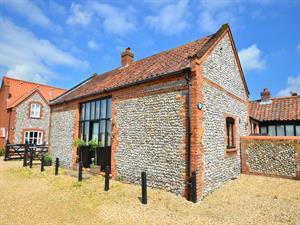 Swallow Barn is a charming semi-detached converted flint and brick property situated in the village of Bodham close to the coastal towns of Sheringham and Cromer. An ideal location for both the coast and inland towns like Holt with its Georgian properties, independent shops, good restaurants, pubs and Coffee shops just a few miles away.